Stagecoach Community Park will host a Family Movie Night presentation of Madagascar 3: Europe’s Most Wanted on Saturday night, September 14, 2013. The movie is free, and fun zone wristbands will be available for $5. The wristbands provide unlimited access to the circus-themed fun zone that includes bounce houses, slides, carnival games and activities. Beverages, hot dogs, pizza, funnel cakes and ice cream will be available for purchase. Wondering what you’re doing on the weekend of September 7-8, 2013? Of course not. You know where you’ll be. You’ll be at the Carlsbad Grand Prix of Cycling. On Saturday, September 7, 2013 join the entire Carlsbadistan cycling community with the Family Fun Ride. The featured Family Fun Ride event starts at Holiday Park in Carlsbad Village, looping out through the Village before returning to Holiday Park. All participants will be given a map with 5 destinations. Those destinations are places required to stop to pick up your wristbands. The main 5 stops will take you on an approximately 2-mile circuit of Carlsbad Village. After collecting all 5 wristbands, you will return to the park where your entry number will be qualified to enter the raffle for the grand prize, plus many more prizes to be announced at 3pm. A 6th bonus stop at any of the 11 Hoehn Motors Carlsbad locations provides you with a free entry into the additional raffle of 2012 Masi Evo Rival road bike (a $20 value), with the winner to be announced at 4pm. . . . Listed stops on the fun ride are: SubZero, Boys and Girls Clubs of Carlsbad, Pedego, The Grand Deli, and Supercuts. Please note, the Family Fun Ride is NOT a race. Fastest time wins nothing. 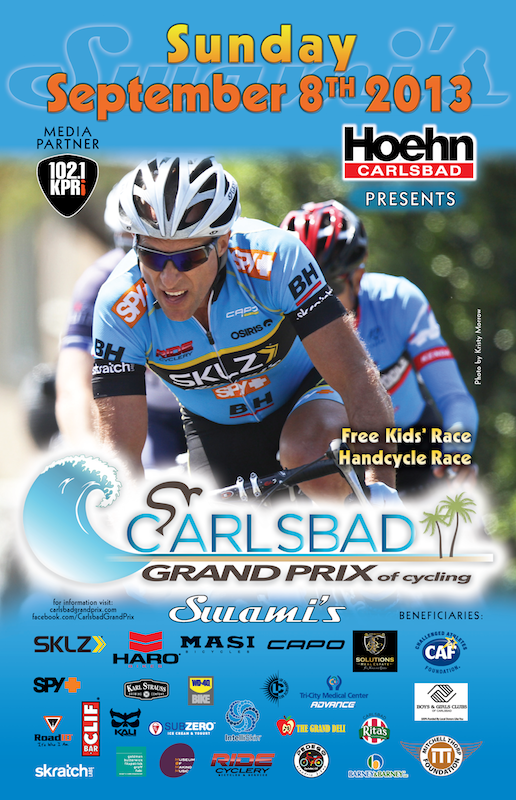 On Sunday, September 8, 2013 the action heats up above the Flower Fields as Southern California’s strongest criterium racers dice it up in the fast and furious Carlsbad Grand Prix of Cycling. This full day of races will feature more than 600 junior, amateur, professional, and Paralympics hand cyclists (via Challenged Athletes Foundation) competing in timed races for prizes and/or cash in front of 2,000 spectators. This event will begin approximately at 7:00am and finish in the late afternoon. Spectating and expo is free and open to the public. To register for the race click here. For more information on the entire event, click the link. Pictured (L to R back row): State Beach Locals Isaac Penrod, O.B. 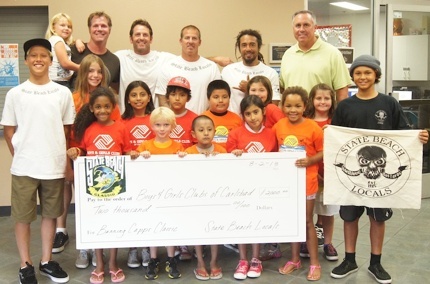 Juncal, Phil Antonopoulos, Terry Ennis, Ulises Thomas, Slater Thomas with Club CEO Brad Holland and a few new Club friends. Aside from showing off some of Carlsbadistan’s next wave of talented surfers, the State Beach Locals Banning Capps Classic surf contest held June 9, 2013 at Tamarack Surfing Beach raised $2,000 for the Boys & Girls Clubs of Carlsbad. 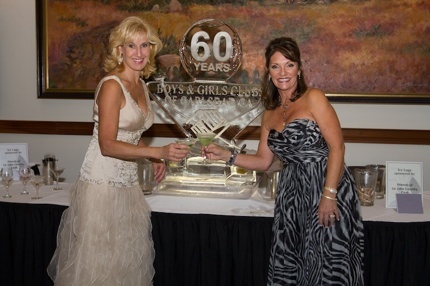 Pictured (L to R): Gala Co-Chairs Viola Wheelihan and Barbi Nelson. The Boys & Girls Clubs of Carlsbad are hosting their largest fundraising event of the year, their annual Come Play With Us Gala, at the La Costa Resort and Spa on Saturday, September 28, at 6:00 p.m. .
“Everyone is invited to come, dance the night away, and give to a great cause!” says Gala Co-Chair Barbi Nelson. “We want everyone to show up and celebrate the Club’s impact,” added Gala Co-Chair Viola Wheelihan. . . More than 550 business and community leaders are expected to attend this social event of the season complete with lavish cuisine and dancing to Bonnie Foster Production’s dynamic Wayne Foster Experience.